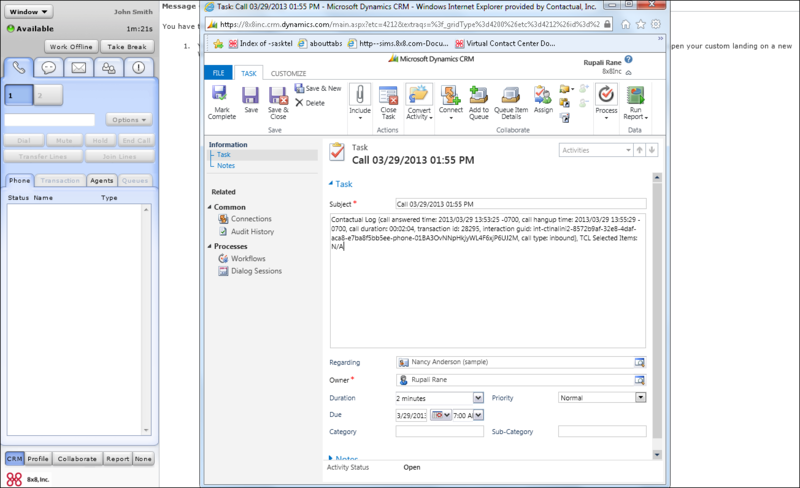 You are here: Configuring Virtual Contact Center with Microsoft Dynamics > What is an Auto Log? An Auto Log is a record that is triggered when all interactions that use the enhanced integrated Agent Console are terminated. An auto log automatically logs interaction details of all interactions across all media, and relates to an account, contact, or lead. For example, a call log includes information such as call duration, call answered time, call hang-up time, transaction ID, and call type. An inbound auto log automatically associates with the matching record, while the outbound auto log creates an independent task. You can associate a click-to-dial interaction with a desired record by passing extRecordId and extRecordType data.